Beautiful genuine emerald necklace with adjustable silk cord with an embroidered slide which can be used to adjust the length. Indian, from an estate. 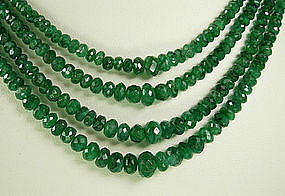 The emeralds range in diameter from 8 mm to 2 mm. Length adjusts from 36 inches to 16 inches. About 1 inch wide. Excellent condition. Photos enlarged to show detail.